The yield curve is now “inverted.” This warning has preceded “seven of four” recent bear markets (more on this in a moment). Time to be safe and sell everything? In 1966, 1973, 2000 and 2006, an inverted yield curve indeed preceded a big stock market pullback (usually by a year or two). Meanwhile in 1978, 1980 and 1989 it didn’t mean much. Don’t become complacent with your dividends! Your portfolio and your income are at the whim of Fed Chair Jerome Powell—now more than ever. I realize he’s acting like a “good boy” at the moment. But what if JP decides to go rogue again and exercise his independence? A surprise rate hike would be catastrophic to many income portfolios. That means you need to “Fed-proof” your nest egg and your dividends. Today we’ll discuss four funds paying dividends up to 10.7% that do just that. 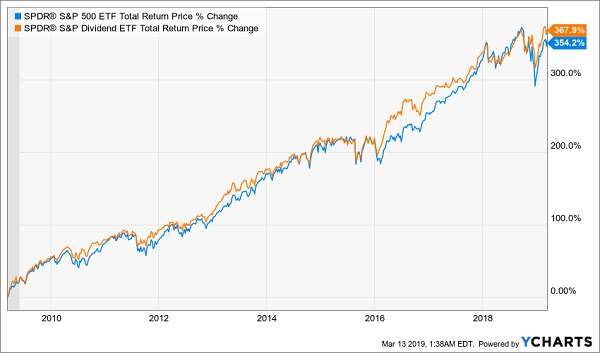 If you want to diversify, get a strong—and growing—dividend and dodge risky speculation, the SPDR S&P Dividend ETF (SDY) may seem like a no-brainer. But buying this fund would be a huge mistake! Today I’m going to show you why, and help you avoid a couple other seemingly obvious moves that could steer you into big trouble. 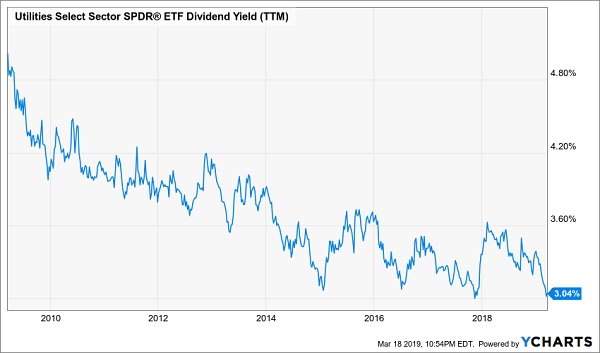 Further on, I’ll reveal a terrific fund paying an outsized monthly dividend (yielding 7.9%) to buy now and tuck away for two decades or more. The Fed poured cold water on its growth outlook this week, all but taking the possibility of a 2019 interest rate hike off the table. Following reports of slower growth in China and Europe in recent months, the FOMC lowered its U.S. growth outlook for 2019 and 2020 on Wednesday, to 2% and 1.9% respectively. Chairman Powell also said that U.S. economy was falling short of inflation targets and the Fed’s internal projections for two rate hikes in 2019 fell to zero. Almost every corner of the market is overpriced today. That includes dividend stocks, which cost too much and yield too little. The S&P 500 is at multi-year highs in almost every valuation metric: P/E, P/B, P/S … you name it. And a lot of that froth is coming from traditional income sectors. Yardeni Research’s latest sector study shows that utility stocks, for instance, trade at 18 times estimates, at the very high end of its 10-year range. The sector’s typically high yields, meanwhile, have dried up to a mere 3%. Hey! 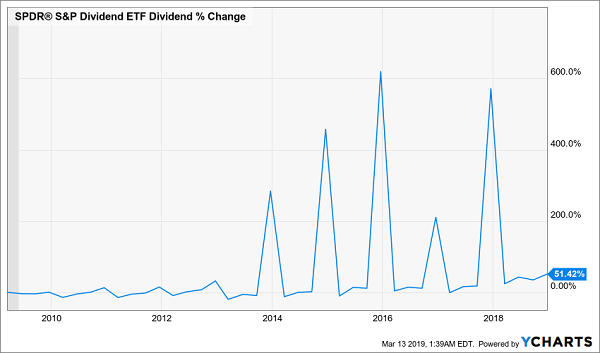 Where’d the Dividends Go? Many retirees like the idea of a “50/50” portfolio that’s half bonds and half stocks. There’s even research that shows withdrawal rates of 3% and 4% may be safer with this mix than they’d be with 100% stocks. 1,000%+ Gains and 7.2% Dividends in 1 Buy. Here’s How. U.S. Markets rebuffed negative headlines from around the globe this week, bouncing back from losses suffered earlier in March. Boeing (BA) lost 11% combined over Monday and Tuesday, following a second tragic crash of its 737 MAX airplane that led to a global grounding of more than 300 of the company’s jets. The decline single-handedly accounted for a loss of more than 300 points on the Dow Jones Industrial Average in 48 hours.